Tutorial Island is the place where new players are sent to in RuneScape when they log in for the first time after making a new account. 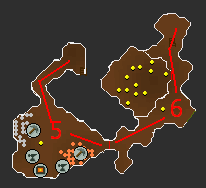 This island is meant to get every new player familiar with the basics of RuneScape so that they have a better chance at surviving in the lands of RuneScape. 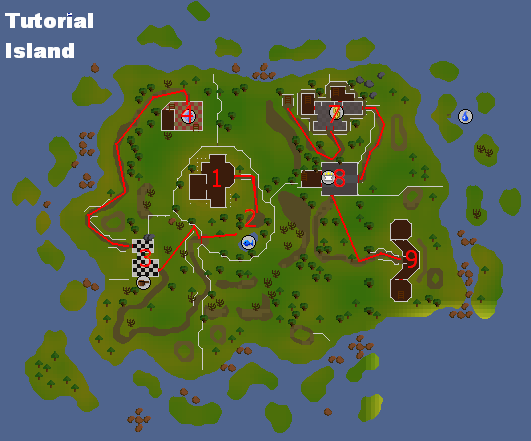 Tutorial Island was replaced by the quest Unstable Foundations on September 17, 2009, and no longer exists in RuneScape. This guide serves only as a historical reference! 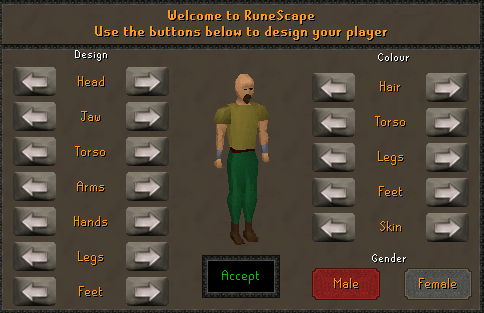 When you first get to Tutorial Island, your first "task" will be to create your character and design his or her looks; everything from clothing and hair, to your character's shape and separate features can be chosen here. Most of your choices can be made-over again by speaking to other characters in the game. Take all the time you need to decide though! Once you're finished deciding, hit the "Accept" button to complete the process-- your character has just been created! You'll find yourself wandering all over the island, although in a specific order to get to each expert located here. You'll even be underground for some parts of this tutorial! There are nine different Experts or Instructors to be found on Tutorial Island, each explaining an important part of RuneScape. They are numbered on the above maps. Your first order of business is to talk to the RuneScape Guide. The RuneScape Guide tells you how to speak to other NPCs (non-player-characters) and how to move around in the game. He explains about changing your camera angle, and afterwards says that the Survival Expert is waiting for you outside. The Survival Expert teaches you how to make fires, cut down trees, cook food over a fire and how to catch fish. Items Gained: Bronze Woodcutting Axe, Tinderbox and a Small Net. First she will give an Axe and Tinderbox and this is when your inventory will pop up. Second she will tell you to cut down a tree and burn the logs and after this your stats will be viewable. Third she will give you a Small Net and tell you to catch some Shrimp (some advice is catch two Shrimps because the first time you try to cook it over a fire it will burn). Lastly she will tell you to cook the Shrimp and when you do so you move on to the Master Chef who will show you the better things in life like cooking. The Master Chef will teach you how to cook over a range and will teach you about your Music button and how to use it. Items Gained: A Bucket of Water and a Pot of Flour. First he will give you a Bucket of Water and a Pot of Flour and he will tell you to mix them. Second, he tells you to take the dough and cook it on the nearby range. Third, your music window will be viewable and he will tell you to visit the Quest Guide. Lastly, he will tell you about running and using your energy. The Quest Guide will tell you about Quests and how to view the Quest pages of your journal. First, you need to talk to him about Quests before the Quest tab is viewable. Second, he will tell you to go down the ladder to visit the Mining Instructor. The Mining Instructor will teach you how to prospect rocks, as well as mine and smith ores and bars. Items Gained: A Bronze Pickaxe, Hammer, and a Bronze Dagger (which you smith). First he will explain to you about prospecting rocks, and then you will need to prospect a Copper rock and a Tin rock. Second he will give you a pickaxe and tell you to mine the rocks. Third, he will tell you to smelt the ores in the Furnace. Fourth, speak to him and he will tell you to smith it into a Dagger on the anvils, and he will give you a Hammer. Lastly, once you make the Dagger, you can move onto Vannaka the Combat Instructor. The level 146 Combat Instructor named Vannaka will teach you how to fight in close (melee) combat and how to fight from a distance (ranging). Items Gained: A Bronze Sword, Wooden Shield, Shortbow and 50 Bronze Arrows. First he will tell you to equip your Dagger, and afterwards the equipment tab shows up. Second, he says that the Dagger is too weak and he'll give you a Bronze Sword and Wooden Shield, and your fighting style button shows up. Third, he tells you to kill a Rat and make your first kill. Fourth he gives you a shortbow and 50 arrows and tells you to kill a Rat from far back behind the fence. Fifth, you can go up the ladder to the bank. 1.Vannaka is actually the Slayer Master found in Edgeville. 2. You cannot die on Tutorial Island. There are two Bankers you can talk to, and they will teach you about using the RuneScape banking system. When you access your bank for the first time, you'll have 25gp to start off with. After speaking to him, go through the next door to speak to the Financial Advisor. The Financial Advisor will teach you the 3 best ways to make money in RuneScape. Before you even talk to the advisor, you have to access your bank account which contains 25gp. You can withdraw or deposit anything you wish at any time. Now you can go through the door to meet with the advisor, who explains about making money. Then he tells you to visit Brother Brace. Brother Brace will teach you about Prayer and the Friends/Ignore lists. He will tell you about Prayer and Altars, and then he will tell you about using the Friend and Ignore Lists. He also tells you about the in-game rules. It's also worth noting that, while you may have a friends list and the ability to see if they are online, you can't message them until you reach the mainland. 1. There's an Organ upstairs which you can play. There are only 4 playable Organs in the RuneScape world, including this one, and when you play it a "secret" song will play! The Magic Instructor tells you how to cast spells and use the spell list. Items Gained: 5 Air Runes, 5 Mind Runes, 4 Earth Runes, 6 Water Runes and 2 Body Runes. First, he will tell you to open up your spell list. Second, he will give you 5 Air and Mind Runes. Third, he tells you to cast Wind Strike on a Chicken. Lastly, he says that you're ready for the real world and teleports you to the center of Lumbridge Castle. Congratulations, you've completed your Training at Tutorial Island! You're now free to move around RuneScape!